The simple solution would have been to purchase my own bonafide synthesizer, but that would seem to abandon a lot of the hard work I had already put into guitar, and a lot of potential in pursuing these same established synthesized sounds from a different angle. This tension between the simple act of buying a dedicated synth, versus walking the harrowing road of guitar synthesis, seems to define the sounds, and the pursuit of synth guitar playing. You are almost already behind the eight ball when you venture to call a guitar effect a synthesizer, as you are setting yourself up for disappointment when that effect doesn’t actually sound like what you think it will. The answer seems to be that true happiness in guitar synthesis falls somewhere between this disappointment, and the dream of what could be. My personal journey toward finding happiness with guitar synthesis always seems to be defined by compromises between these kinds of extremes. The answer is never black nor white, but between these two extremes is a full spectrum of sounds and an enormous color palette with which you can find your own voice. Sometimes the effect can succeed in full, and gives you that vintage synthesizer tone you have been looking for. Sometimes that beautiful voice is one that falls short of purely recreating a vintage synth, but remains a valid voice of its own. And lastly, sometimes the act of that effect going totally berserk is really what what it is good for. 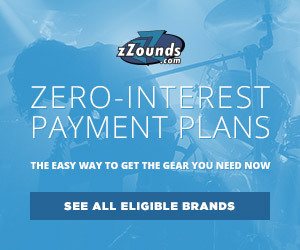 If you extend this thought to the full realm of guitar equipment, you will find that the discovery of most beloved guitar sounds is the same. Whether a guitarist is perverting the clean tones of Leo Fender into overdrive, or letting the batteries in their fuzz pedals diminish to where they generate glorious “sag voltage” tones, guitar history is filled with best intentions gone wrong, and happy accidents along the way. 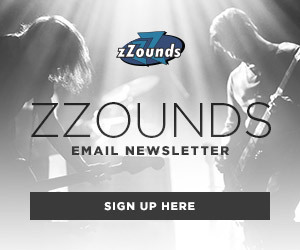 As someone who has spent a lot of time and money on this path, I would like to walk you through some of my favorite synth guitar pedals, and the most glorious ways that they succeed and fail. 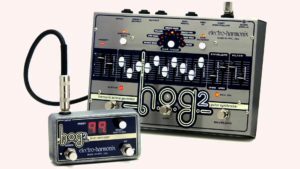 The HOG 2 by Electro-Harmonix has proven time and again to be the core of any good attempt I have made at guitar synthesis. This is the true “Ministry of Magic” when it comes to approaching the main features you would have available on a keyboard synth. Central to the unit is the warm, triangle wave-like sound generated by each of the ten voice control faders. These can be set in almost limitless combinations to approximate the sounds of Hammond and cathedral organs, string instruments, wind instruments and many others. You can also use the faders by themselves or in pairs to pull out fat bass tones or harmonized leads in fourths or fifths. Also built in are envelope and filter sections which are essential to mimicking synthesizer tone. On one end, the envelope can take a small edge off the attack or prolong it for longer swells. A medium amount of attack is a great recipe for dialing in stringed instrument or fretless bass sounds. The filter section is made unique to any other wah or EQ by its resonance setting. Like on a keyboard synth, this slider allows you to set the curve to a smooth rise to some more severe and unstable settings. A highlight of this filter is the sweet spot on higher resonance where changing the cutoff frequency begins to pull out ethereal overtones from your fundamental signal. 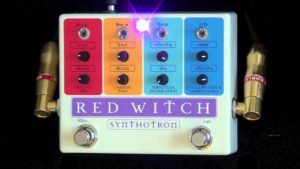 Out of every pedal I have been able to get my hands on, the Synthotron by Red Witch comes closest to delivering a pure vintage analog synthesizer tone. This little box delivers a powerful square wave sound doubling your guitar’s dry signal in unison, one octave above, or down to two octaves below. Built into the pedal is also a decay function for both oscillators to give your synth tone more of a tail or to have it cut short, and some filtering tools to further shape your sound. When placed first in your signal chain, the Synthotron functions well as your “oscillator,” which leaves the rest of your pedals to act like other sound shaping modules. An equalizer is a great follow-up to this pedal to emulate softer sine- and triangle wave-style tones. Other good followers in your chain include any pedal with a swell function to manipulate attack, or a wah to act as a filter. The Synthotron’s biggest “happy accident” is in the way that it tracks your guitar signal. Tracking is very accurate when you dial in a warm signal from your neck pickup. There are even some high or low notes that simply won’t work without this specific tone. Dial in a stronger treble tone with your neck pickup, and the tracking goes haywire. The difference between the two is whether the pedal is “hearing” only the fundamental pitch of your guitar emphasized by your neck pickup, or any other overtone that is brought out by your bridge pickup. On the bridge setting, a ‘C’ note can become a ‘G’ a fifth above it it, an octave ‘C’ above, and many more. Imagine a sequencer that has been programmed to the entire overtone series with entirely random order and duration of notes. 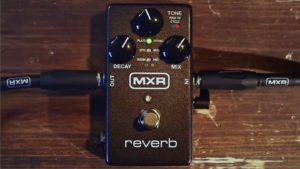 A hidden gem in the synth guitar family is the sixth and final “pad” function on the MXR M300 Reverb pedal. Plugged in normally, you can bolster your dry signal with ethereal waves of undulating synth goodness. Two standard reverb functions, delay and blend, control the duration of the trails on your pad and the overall volume of the effect signal. A third knob for tone gives you a lower octave sound at 0, a boosted upper octave sound at 10, and a 50/50 blend at the noon position. One hidden trick to get rid of your pesky dry signal is the hidden “wet mode.” Activated by the ultimate “Contra code” of tone button pressure plus decay mode setting, wet mode takes out your guitar’s signal entirely so that you can get completely lost in your padded dreamscapes. If you aren’t totally up to leaving your dry signal in the dust for this effect, you can route the M300 on the “B” output of an ABY box, with “A” dedicated to your dry signal, to have both options back at your feet. 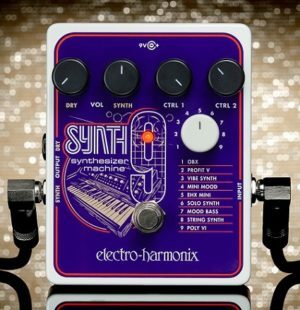 A chronicle of my own synth guitar addiction would not be complete without an honorable mention of the 9 series effects by Electro-Harmonix. 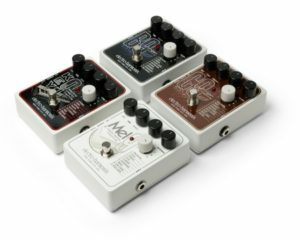 Each of these pedals is a foray into a specific set of “sample patches” which emulate organs, keyboards, Mellotron sounds and – most recently – signature analog synthesizers. 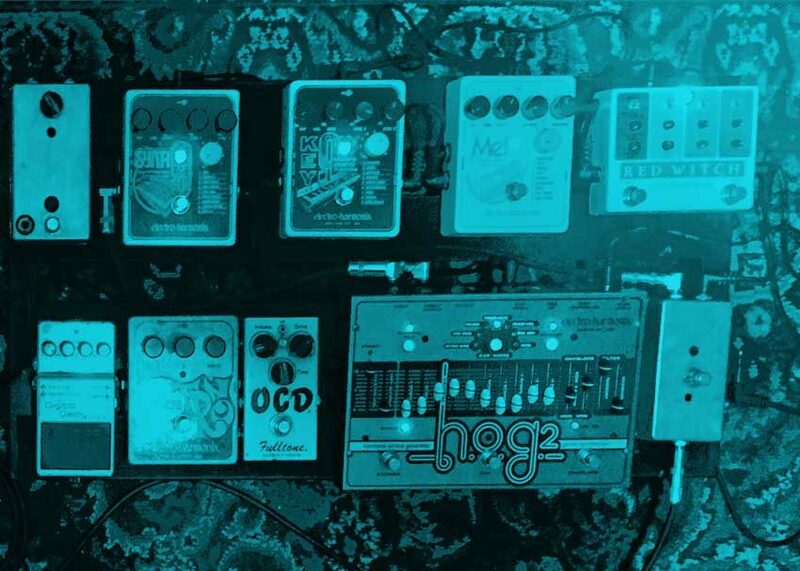 These pedals appear to borrow specific voicings from EHX’s HOG technology, and bolster each sound with tone-specific control functions and circuitry to create an honest library of sampled sounds. The 9 sounds from the Synth 9 really bring home the spirit of the synthesizers they emulate, which is made that much better by the attack and filter style functions of the two control knobs. Many patches succeed on their own as simulations, and can be enhanced with the help of other pedals. For example, the “Wurli” sound from the Key 9 can get that much closer with a mid range bump – minus some lows and highs – from a following 6-band EQ. I personally haven’t fallen in love with the core tones of the Mellotron stylings of the Mel 9 by themselves, but these sounds prove to be solid templates for some powerful tones when put in tandem with some other effects. For example, combining the “Brass” patch with a delay pedal can extend and fill out the tone. Run this patch through any number of mod pedals — chorus, vibrato, phaser, etc. — to further color and modify the sound to your liking. A critical juncture in exploring guitar synthesis was my decision to use individual pedals as “modules” instead of committing to larger multi-effect units like the Roland GR-55. You could have an entirely separate discussion about the technical pros and cons of these units, but there are a few reasons why I ended up shying away from this approach. When you commit to MIDI guitar synthesis, you are basically taking the personality of your guitar out of the equation. Many technique nuances that make your particular playing style beautiful are lost. I ultimately felt that I wanted my guitar to be a Fender Stratocaster, and not just a MIDI controller. It took me a few gigs trying out multi-effect synth units to realize this, but I couldn’t bear taking one multi-effects unit out to a gig and leaving the rest of my pedals at home. Committing to just this one unit would throw out a lot of time I spent learning other pedals that I love, along with a lot of money to boot, and it seemed to leave no room for adding new pedals, or “modules” down the line. My analog pedals just felt more authentic and gave me more creative freedom to have a mess of cables and knobs, rather than menu-diving through a digital screen. If I could plot a graph with “level of excitement over a synth pedal” on the “y” axis versus “stage in ownership” on the “x”, I feel like it would always carry the same shape. It always seems to begin with “really excited” upon hearing about said pedal, followed by “really, really excited” throughout the purchasing process. The next stage, which seems to be paramount to the entire synth pedal phenomenon, is the sharp decline in excitement shortly, or immediately, after you try it for the first time. Once reality slashes through your extreme — and often unfair — expectations, it is hard to not be left thinking “is this it?” Or “How the hell do I use this thing?” This, to me, is the critical and defining moment in what truly makes or breaks a synth guitarist; this critical juncture where a player either chooses between two options of phase 4 on the graph, “commitment,” or “return to sender.” While “return to sender” is a flat line, “commitment” will almost always spell a positive correlation, even with its inevitable peaks and valleys. If you could boil down this entire experience to one unifying factor, it would be that each pedal in and around the synth guitar genre is not merely an effect, but an instrument in its own right. When you consider that you are controlling this instrument with another instrument: your guitar, you are bound to end up with a roller coaster ride of tingly feelings in finding new sounds, and harrowing moments in justifying keeping these often expensive units. I have sidelined effects units for months — years even — while discovering their true value, or finding them missing the mark. It almost always proves out that I will eventually add them back into my rig for a gig, or a night, or even indefinitely, and that my commitment always seems to prevail.